This morning around 8:00 AM EST most smartphone owners in the New York area were surprised to receive an emergency alert on their device. Because of the loud sound it makes even when the phone is muted, it shook a lot of people during their morning commute. 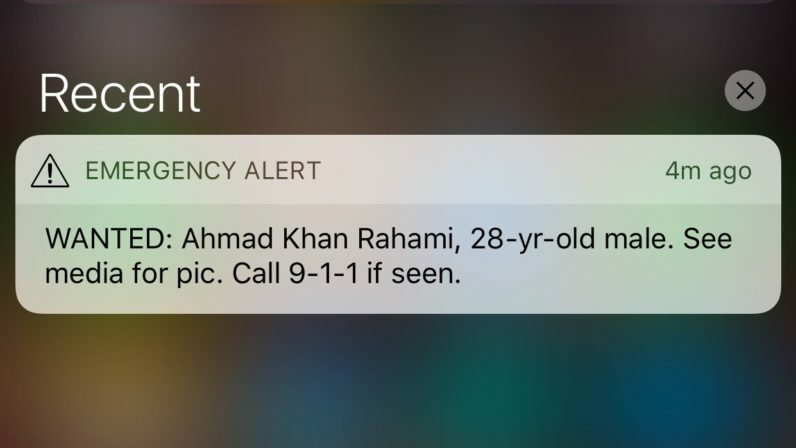 It’s the first time this kind an emergency alert has been sent to aid the search for a wanted suspect — normally the system is used only in cases of extreme weather warnings, AMBER alerts and crisis situations. Because of the text-only nature of an emergency alert, the message asks to look for a picture in the media. In the light of last week’s explosion in the Manhattan neighborhood of Chelsea, the alert system has also been used to signal people in a selected area to watch out for the possible detonation of a suspicious package. Emergency alerts are sent to people within a specific geographic area, and are delivered almost instantaneously on modern smartphones connected to a cellular network. According to the FBI wanted notice, the 28-year-old male should be considered “armed and dangerous”. If you think you have seen the wanted suspect it’s recommended to follow the alert’s instructions and call 911.